Produced by: Amblin Entertainment and Warner Bros.
animated cartoons. Animaniacs, which debuted Monday, September 13, 1993 on Fox TV, is possibly the most highly regarded animation he was ever associated with. The first Animaniacs seen were The Warner Brothers (and Sister), supposedly old-time Looney Tunes characters (contemporary with Bosko and Buddy) whose films were never released because they made no sense. They themselves were locked up in the water tower on the Warner Bros. lot, which has served as a Hollywood landmark for decades, because they were too obnoxious to run free. They finally got out to wreak havoc on the world. Their back-story and first couple of havoc-wreaking adventures filled the show's opening half-hour episode. The second episode, aired the next day, introduced Pinky & the Brain, a pair of laboratory mice constantly trying to conquer the world. The third added Slappy Squirrel, another fictitious star from the 1930s, but one whose back-story included cartoons that were supposedly actually seen by the public. Then came Goodfeathers, Buttons & Mindy, Rita & Runt, Hip Hippos, Chicken Boo, Katie Ka-Boom and others, plus the occasional cartoon without continuing characters. Even Looney Tunes or Tiny Toons characters would turn up from time to time. More than any other TV cartoon show in history, Animaniacs, with its unpredictable mix of major and minor show segments, resembled the actual output of one of the classic-era studios. In some ways, in fact, Animaniacs was more unpredictable than one of the old studios, because the show segments even varied in length. Good Idea/Bad Idea and Mime Time ran less than a minute, while some of the Slappy or Warner Brothers (and Sister) stories ran as long as two thirds of a show. Most ran somewhere in-between. and, of course, many, many more. 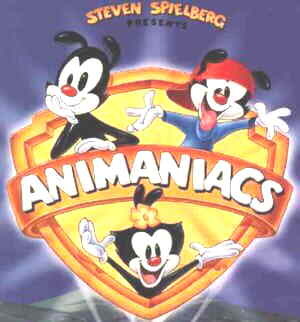 Critics have called Animaniacs "a modern classic" and "the funniest cartoon since Rocky & Bullwinkle." Viewer response kept new episodes coming out for five seasons, 99 half-hours in all, and even mandated a spin-off — Pinky & the Brain got a show of their own in 1995. The Warner Brothers (and Sister) appeared in a theatrically-released short cartoon, I'm Mad, which came out March 30, 1995; and the whole crew appeared in a feature, Wakko's Wish, released to video on December 21, 1999. DC Comics published a comic book version from 1995-2000. And of course, there have been coloring books, video games, T-shirts, figurines, and all sorts of other merchandise. Animaniacs soundtracks, videos, games etc. are still easily available, and the show is frequently rerun on TV.